The Blinks/NSF REU/Beacon Summer Internship program offers hands-on, full-immersion summer research internships to 12-15 motivated undergraduates and post-baccalaureates. 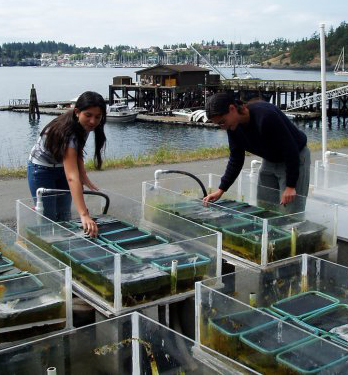 By linking students with marine scientists, students learn both the process and the substance of scientific research. Participants in the NSF Research Experiences for Undergraduates program will work 1:1 with a scientist on a full-time basis for eight weeks. The program is funded by the National Science Foundation, the Blinks Endowment and BEACON. The Andrew W. Mellon foundation, ASCB and FASEB also contribute. Along with receiving additional full-time assistance from a motivated student for your research at FHL and the rewards of enriching this student with a once in a lifetime experience, FHL will provide laboratory space and a structured program for your intern to fully engage in the summer activities at FHL. To apply, please submit an e-mail with the following application elements to Dr. Billie Swalla by February 15 for that same summer internship (e.g. February 15, 2016 for Summer, 2016). You can refer to last years internship programs for descriptions of projects that could serve as a model for your proposal. Note that this is in addition to your researcher application that should have been submitted by February 1. How many students could you mentor? How will the addition of an intern add use of FHL facilities in the following categories?